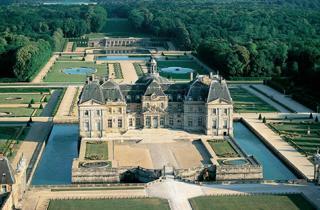 Vaux le Vicomte, the largest privately owned chateau in France, is classed as historical monument. Vaux is a combination of three exceptional features : magnificiant architecture, sumptuous decorations and a breathtaking garden. To realize Nicolas Fouquet's ambition (Louis XIV superintendant of finances), three talented individuals were employed : the architect Louis Le Vau, the painter and sculpter Charles Le Brun and the landscape gardener André Le Nôtre. The architecture, decorations, furnishings and art collection were all restored to their former glory by Mr Alfred Sommier, who bought the chateau at the end of the 19th century. Today, his descendants are continuing the work he started and whish to share this masterpiece with their visitors. Candlelit visits, panoramic view from the dome, watery extravaganzas, rides around the gardens in electric golf cars or on the canal with the "Nautils". Self service restaurant and tea room, gift shop.